TEGUCIGALPA, Nov 22 2013 (IPS) - The capital of Honduras, one of the world’s most violent countries, has turned into a huge cage, where people lock themselves into their homes behind barred windows and iron doors along the steep winding, narrow streets of the city. And in the poor areas of Tegucigalpa, a city of 1.6 million, people have to make protection payments to the maras or gangs, which set curfews for entering and leaving the areas under their control. 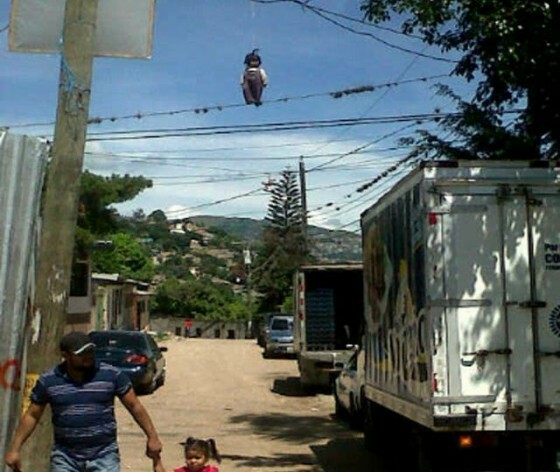 In some of the poor neighbourhoods, the maras mark the limits of their territory by hanging dolls from the power lines, IPS saw. In the Sunday Nov. 24 elections, 24, this society held hostage by soaring levels of violence crime will choose between hard-line zero tolerance and more integral approaches that take into account prevention and socioeconomic aspects, to combat the problem. On average, 20 homicides a day are committed in this impoverished Central American country of 8.5 million people. In 2012 alone, 7,172 murders were committed, according to the Autonomous National University of Honduras’ Violence Observatory. That makes Honduras the country with the highest homicide rate in the world, according to the latest ranking by the United Nations Office on Drugs and Crime (UNODC), with 96.1 murders per 100,000 population, compared to a global average of 8.8, a Latin American average of 29, and a Central American average of 41. In Peña por Bajo, a poor neighbourhood on the south side of Tegucigalpa, the police announced with great fanfare three months ago that they had seized control of a dozen houses from the gangs. But a month ago, after the police had stopped patrolling the area, the maras destroyed the houses and the people who were living in them had to flee. The people of Tegucigalpa are also fed up with extortion rackets – which not even the politicians escape. Candidates have told the media that they have had to pay “taxes” to criminals to be allowed to enter certain areas to campaign. In the last four years, 2,607 people have also been displaced from their homes because of the violence, according to the United Nations refugee agency, the UNHCR. Karim Vargas is tired of living in danger, and says she doesn’t know to what extent Sunday’s elections will change her life. She lives in Peña por Bajo and works as a receptionist in a hotel. And although she wants security, she is not convinced that militarisation is the answer. Juan Orlando Hernández, who promises to be tough on crime. Hernández, the president of Congress, which his party controls, is the architect of the recently created Military Police of Public Order (PMOP), which will carry out intelligence work to fight organised crime. In October, the new force’s first 1,000 agents began to patrol the streets of Tegucigalpa and the second-largest city, San Pedro Sula, in the midst of the election campaign, without receiving training for their new policing and intelligence tasks. “You feel a little bit safer when you see them in the streets,” said Vargas, 28, the mother of a two-year-old daughter. “But we know this won’t last, because when they leave, the mareros [gang-members] will come back and spread fear and everything will be the same again. “It’s all politics, and that won’t save my life,” she told IPS. Bringing down the rates of violence and crime is the most pressing issue in the campaign for the election of President Porfirio Lobo’s successor, who will take office Jan. 27. Hernández is competing with seven other candidates from nine political parties, in elections that will mark the end of a two-party system and the emergence of a multi-colour array of political forces after decades of control by the PN and the Liberal Party (PL), a more moderate right-wing party. Besides the PN and PL, the parties disputing the elections include the social democratic Innovation and Unity Party, the Christian Democrat Party, and the left-wing Democratic Unification party – all of which are smaller traditional parties. But the political, social and institutional upheaval caused by the June 2009 coup that toppled then president Manuel Zelaya, leader of the PL at the time, led to the emergence of four new parties, which people who want change have pinned their hopes on. The parties are the left-wing Freedom and Refoundation (Libre) party, created by Zelaya when he returned to the country from exile in 2011, the leftist Broad Front of Political and Electoral Resistance (FAPER), the centre-right Anticorruption Party, and the far-right Patriotic Alliance. These elections will also mark an end to the institutional effects of the coup, because the elections that Lobo won four years ago were organised by a government that had taken power in a coup, and it took months for the new president to be recognised by the rest of Latin America and by the international community. Libre, Zelaya’s party, stands a real chance of turning the PN and the PL into opposition parties. The party’s candidate is Zelaya’s wife, Xiomara Castro, who is neck and neck with Hernández according to the latest polls, carried out in October. Castro has 29 percent poll ratings, compared to Hernández’s 27 percent, while the third in line, Mauricio Villeda of the PL, has recently seen his popularity spike, which has created a new sense of uncertainty about the outcome. Castro, like Villeda, advocates an integral approach to fighting crime, which would combine police measures with prevention and rehabilitation. She proposes community policing, with agents who establish a closer relationship with the people in the neighbourhoods they patrol. Custodio does not believe the problem will be solved by any of the candidates, no matter who is elected. He recommended that Honduras enter a new era of broad pacts and reforms, to avoid opening a “Pandora´s box” that would generate greater problems of governance. Besides electing a new president Sunday, voters will choose three vice presidents, 128 legislators and their alternates, and the mayors of the country’s 298 municipalities. legalize personal possession of all drugs, big pharma needs to go and Honduras like all of CA needs to start to cultivate HEMP NOW!